CTAT Flash tutors can be delivered in a browser using HTML files. This page explains how to make a HTML page that will deliver a Flash tutor. You may also deliver Flash tutors in TutorShop or through the OLI online course delivery system, in which case, you follow a similar routine. The HTML file that is served to present the tutor will include an <Object> tag. Inside the Object tag, you can optionally include a flashvars parameter. When any Flash Movie (i.e., a .SWF) starts, it looks for a flashvars parameter and if found, converts the value into a series of variables that the Flash Movie can use. This is a mechanism for initializing data for Flash Movies. The video file (.FLV) when using the Video Component. 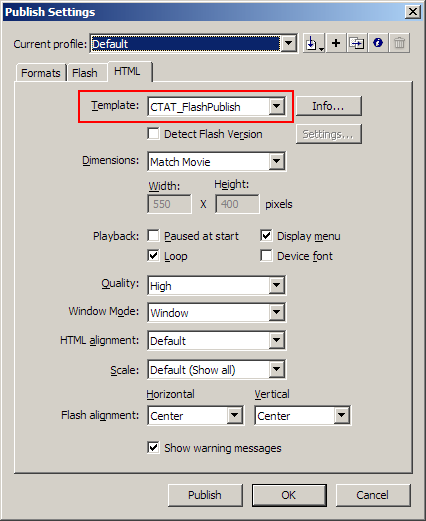 CTAT supplies a publishing template named CTAT_FlashPublish.html with the CommComponents.mxp installation file. This file can be used from within the Flash IDE to publish a Flash Movie. Next to Template, select CTAT_FlashPublish, as shown in Figure 1. This template includes a flashvars tag that includes all the necessary parameter names for publishing a tutor. The details of this document are included in comments in the template file. With your tutor open in the Flash IDE, select File > Publish. By default, the HTML and SWF files will be copied to the same directory as the FLA.
Test your tutor by viewing the generated HTML file. (Optional) Copy the HTML, SWF, and BRD(s) to a web server for viewing on the Internet. If you are using TutorShop or the OLI online course delivery system, you won't need to publish using this template. But, the template includes documentation about setting CTAT specific parameters such as PSLC logging values (.e.g., course name) and CTAT tutor specifics (e.g., .BRD file path) in the OLI learning pages. The CTAT_FlashPublish.html file is copied to your local file system when installing the CommComponents.mxp file.